“Cold turkey” quitting can deter many smokers with many withdrawal symptoms; vaping offers ex-smokers an easier way to kick the habit. One’s first personal vaporizer (PV) or electronic cigarette can significantly influence the vaping experience, and outcome of the attempt. If you want to get a positive experience on the first try, ViVi Nova is the tank is a good choice if you are seeking bold flavor, and a strong throat hit. The vape you get from it tastes delightful, but it is made for stronger APVs or personal vaporizers. With at least 2.5ml of e-fluid, this tank can provide you the handiness of an all-day vape. Lighter smokers might prefer compact e-cigs or eGo battery type devices for a smoother, less powerful vaping device, but heavy smokers often find themselves craving cigarettes quickly after trying out the smaller vaporizers. ViVi Nova tanks come in two different sizes: the less elegant “Full Size,” which stores 3.5 ml of e-juice and the sleek “Mini ViVi,” which holds 2.5 ml of e-juice. Other than the capacity storage, the two basically work the same way, with standard 510 threading. The full size is typically preferred for convenience of having more e-liquid capacity, while the ViVi Nova Mini provides a sleeker look. But, both are very strong tanks that overpower the likes of a CE4 tank for example. The Mini works best for eGo styled batteries when it comes to looks, but they both operate similarly. Both ViVi Novas are designed to work well with advanced personal vaporizers, which means they have strong atomizers and produce large clouds. However, if you use it with a smaller eGo battery, it certainly helps lower down the strength of the throat hit, making it bearable for lighter vapers. 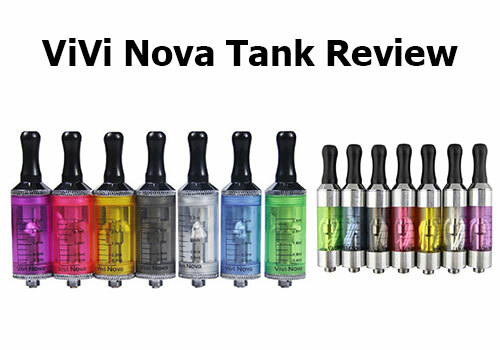 Latest revisions brought important modifications to the ViVi Nova Tank, including an improved airhole, tubes and coil heads. The kit: It generally comes with a transparent (clearomizer) or polypropylene (frosted) tube/tanks, a black drip tip and a long wick, which can be trimmed to suit your preference. Screw-on replaceable atomizer heads: Some brands come with one atomizer head in 2.4 ohms, while others have three interchangeable atomizer heads -1.8, 2.4 and 3.8 ohm – for different resistances and for varying vaping experiences. Rebuildable tanks: These tanks are virtually leak-proof tanks and are rebuildable allowing you to take it apart to clean the individual parts or replace parts as needed. Getting more durable replacements (metals) means you can extend the life of your PV. Color options for the tank: The transparent tanks are available in colors such as – pink, red, blue, black, and silver. These give vapers, especially ladies, flexibility in creating their own personalized, chic PV. Metal replacement tubes (anodized aluminum): These have windows on two opposing sides that help vapers monitor the e-juice level to help prevent dry hits. Metal replacement heads: These are meant to protect the battery heads to keep them working longer, but also add to the appearance. Mini Vivi users would be happy to know that replacement heads are just the same as its full size version. 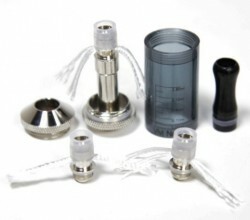 510-compatible Drip Tip and Threads: The unit is made up of the drip tip and four threads that are easy to set up and lock. It is removable so it can be replaced with any 510 threaded drip tip, for easy filling, and to replace the heating element. The drip tip also comes in varied colors to further customize the look of your PV. Different ohms and vaping pleasure: The heads produce excellent vapor, intense flavor and strong throat hit even if you just have the 2.4 ohms coil. By experimenting using different resistances (ohms), you can experience varied hits until you discover your e-liquid’s sweet spot. If you are using the right tank capacity you can easily vape all day without running the inconvenience of refilling. Assembly, refilling and use entail simple steps: Filling the tank is easy. You only need to remove the end cap to fill it to your desired level; no syringe is necessary. It is just important to avoid introducing e-juice into the middle hole. Don’t get the e-juice too low to keep the intense taste. Hold the vape upright to get the wick soaked in e- liquid. It is easy to take apart and rebuild: This makes ViVi Nova easy to clean and care for so that its life is extended. Newbies have little difficulty setting it up, taking it apart or rebuilding it. The ViVi Nova features a replaceable atomizer head: Once the atomizer head burns out, you must simply loosen one of the end caps and replace the atomizer head with a new one. There are too many makers: This makes it hard to establish which one has the quality you want to go for. It is important to identify the brand that is reliable in terms of quality, features and price. You should know the product’s limitations: For instance, you are warned against use of 100 percent VG-based e-fluids. You are also cautioned against use of cinnamon-flavored e-juices with plastic cartomizers. A blend of 70PG:30VG is recommended for finest results. An extra step required for ViVi Nova Full Size: Unlike the Mini ViVi, the Full Size is doesn’t really look compatible with eGo (preferably Ego C Twist [hyperlink with Ego C Twist]) battery. A so-called “sleeve” needs to be screwed onto the central part of the battery to improve its appeal. It needs a cone connector. A cone connector is necessary to close the gap between the tank and the battery. Compatibility: ViVi Nova is 510-threaded, which makes it compatible with eGo Series batteries. Although I mentioned these tanks to be designed best for powerful PVs, I myself much prefer the Mini tank matched with an eGo-C Twist battery, and here’s why; I can’t handle strong vapor hits and prefer a lower temperature for my e-juice. The twist allows me to easily adjust voltage to match any flavor, and I can tweak it to my cravings across the day. The eGo gives me a faster craving satisfaction. In the long run, I still get an irritated throat if I constantly use them, so I balance it out with compact e-cigarette devices, which output a much smoother, lower powered vapor. You can use it with all 510 thread compatible devices such as BOLT, ZMAX, and MVari. Enhancing it with a cover or cone: Though not really necessary, the visual appeal can be enhanced with an eGo Cover for DCT or Short eGo Cone. Since eGo Series battery has outer cone threads, concealing them can make the PV look better. The tank assembly typically carries a warranty. The atomizer heads are covered by a warranty but only for DOA. 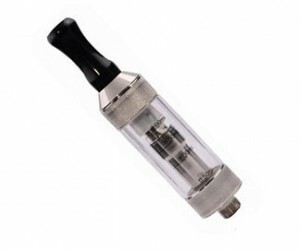 The clearomizer being consumable is not typically covered, unless it is defective and unused; replacement exchange must be done within 7 days after purchase. 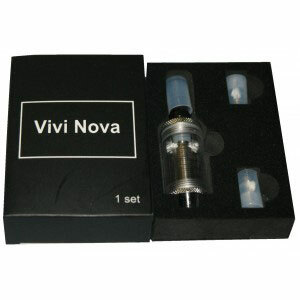 Since there are many manufacturers of ViVi Nova, it is easy to find places and sites to buy from. 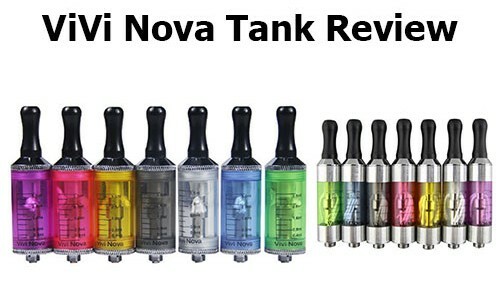 Not all ViVi Nova tanks, however, are manufactured equally. This can offer difficulty when choosing the best quality ones. Check out reviews before making any purchase.